What World Leaders Say, And What They Do : Parallels Many leaders have criticized the attacks in Paris. How does this square with their own records on freedom of the press and human rights? World leaders march in Paris on Sunday to honor victims of the attacks in France. Some of those who have been critical of the attacks have a mixed record on press freedom and human rights at home. 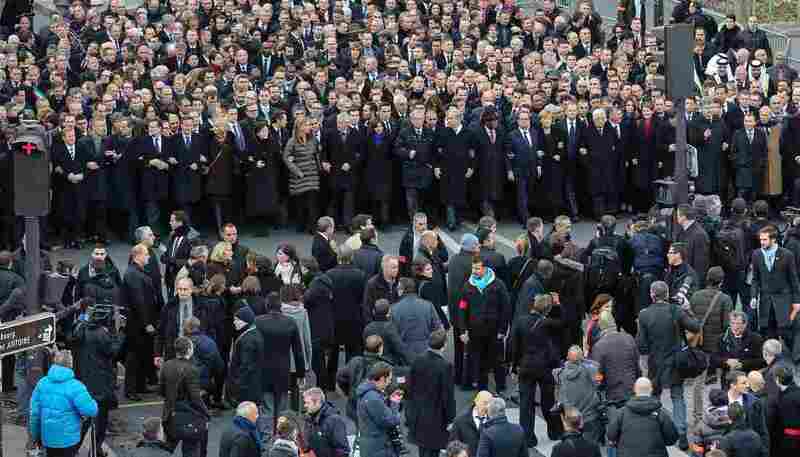 Plenty of world leaders have condemned the deadly attack on the French satirical magazine Charlie Hebdo, and a fair number took part in a rally held Sunday in Paris. But as is always the case, it's much easier to condemn actions abroad than critically examine one's record at home. "On what grounds are representatives of regimes that are predators of press freedom coming to Paris to pay tribute to Charlie Hebdo, a publication that has always defended the most radical concept of freedom of expression?" asked Reporters Without Borders, a Paris-based group. Nigerian President Goodluck Jonathan condemned the Paris killings, but so far he has not spoken about the latest massacre by Boko Haram, the extremist Islamist group that last week carried out its worst attack yet. Boko Haram slaughtered hundreds in the northeastern town of Baga, near the border with Chad, according to witnesses. Jonathan, who is currently running for another term, has also been largely silent about the more than 200 schoolgirls who went missing last spring in Nigeria. "Critics ask how he found time, during his campaign, to condemn the Charlie Hebdo killings in France but has remained silent about relentless deadly raids in Nigeria's northeast," NPR's Ofeibea Quist-Arcton reported. Saudi Arabia called the Paris shooting a "cowardly terrorist act" at a time when a Saudi blogger was about to receive the first installment of a 1,000-lash punishment for criticizing the kingdom's religious establishment. The blogger, Raif Badawi, got the first 50 lashes Friday in a public square in the western port city of Jiddah, where hundreds looked on. Badawi is set to receive 50 lashes on each of the next 19 Fridays. He founded the website Saudi Liberal Network, which criticized influential clerics who preach an austere form of Islam known as Wahhabism. Badawi has also been sentenced to 10 years in prison and fined the equivalent of $266,000. The U.S. State Department, through a spokeswoman, has described the punishment as "inhumane." Turkish Prime Minister Ahmet Davutoglu took part in the Paris march although his country has jailed more journalists than any other country and is currently holding 40, according to the Committee to Project Journalists. Many of the jailed journalists are Kurds who have been critical of the government's treatment of the minority. Egyptian President Abdel-Fattah el-Sissi described the Paris attack as terrorism that "should be confronted and eradicated through joint international efforts." Al-Jazeera's Mohamed Fahmy pleads his case to the judge in Cairo last May. 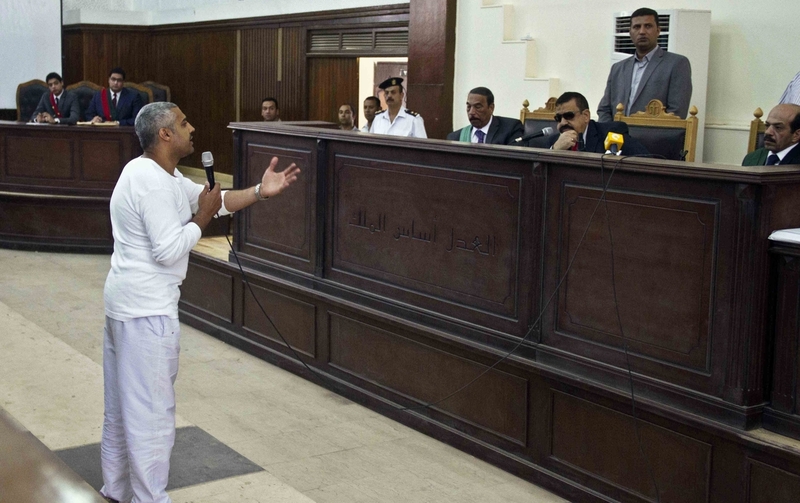 Fahmy is one of three Al-Jazeera journalists convicted of terrorism charges. However, human rights groups criticized Sissi's government for jailing thousands of opponents and critics as part of his sweeping crackdown that has targeted Islamists but includes journalists as well. Three Al-Jazeera journalists have been convicted of terrorism and jailed for more than a year in a case that has drawn widespread international criticism. "We were accused of joining a terrorist group conspiring against the Egyptian state and reporting 'false news.' In reality, we were simply doing our job as journalists," Mohamed Fadel Fahmy, one of the three, wrote recently in an op-ed in The New York Times. Russian Foreign Minister Sergey Lavrov marched in Paris, even though under President Vladimir Putin Russia has consistently suppressed critics and opposition groups. 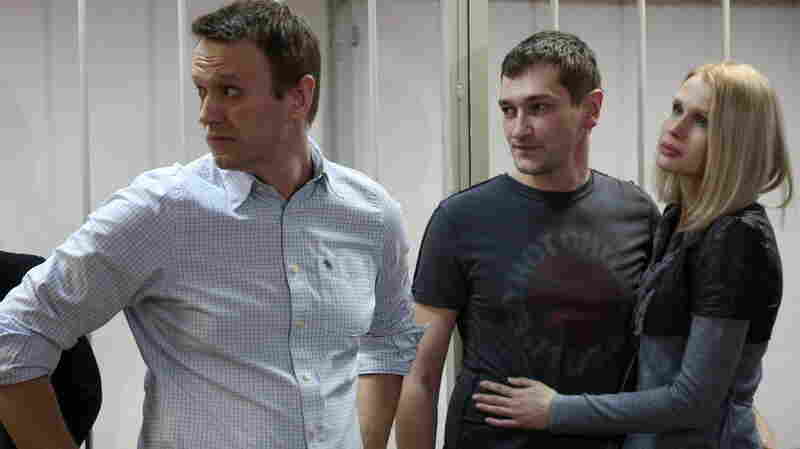 Russian opposition leader Alexey Navalny (left) and his brother Oleg Navalny appear in Moscow for sentencing last month after their conviction for fraud. Alexey was given a 3 1/2-year suspended sentence. His brother was sent to prison for the same period. Alexey Navalny, an opposition figure and the country's best-known blogger, had been under house arrest. He was recently given a 3 1/2-year suspended sentence and his brother Oleg received 3 1/2 years in prison for an embezzlement conviction. Human rights groups denounced the court proceedings, saying they were the latest example of punitive measures used against government opponents. The European Union's foreign policy chief, Federica Mogherini, said on Dec. 31 that the charges "have not been substantiated during the trial" and called the case "politically motivated."